From the many requests we have received we thought we should give an update on the Great Kiff. He has accepted that he will be known as the Great Kiff after his superb Puffin Ninja training by the Great Ninja Puffin. Our Kiff will become wise and wonderous to all people. His first day of training went well, the first day of training was the Day of Pain. In which our Kiff was placed in a tiny crate with nothing but his mind, where he had to successfully open an emergency tin of tuna with nothing but his new Puffin mind. Early reports say there was much wimpering and crying, but we eventually had success. Meanwhile on the Scouting front, those of you who know the Cilben Collective Master, Cilben. Might know he is a bit of a history buff, after reading the following this morning it got me thinking about our Scouting origins and homes. This reminded me of Gilwell Park, London. A fantastic place as the home of Scouting in the UK. I’ve only been a couple of times, but it always does feel like it is ‘home’ to Scouting. But then I always feel similar to that when I turn up to other Scout camp sites, I think it’s because you can feel the energy and the feel that it is a place of fun and enjoyment. Even when a camp site is empty or early on a morning just before everyone gets up for the day. Usually there is a morning dew, and a chill in the air and all you can see is a field covered in multi coloured tents. I would recommend to everyone to go and see Gilwell at least once, but to also support your’s and local Scout camp sites, as these are often sites that help support Scouting in those local areas. Not only does it bring in some money, but it’s giving local Beavers, Cubs, Scouts and Explorers that vital adventure of camping. A cracking post! I would agree with you about Gilwell Park feeling like the home of Scouting. 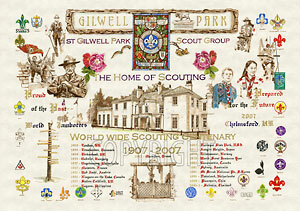 I was just recently there at Gilwell Reunion and I was telling a fellow leader about the site’s history. I think Gilwell Park is perhaps one of the few Scouting places in the UK where you can really connect with the past. If you take a little walk around, there are many reminders of our roots as Scouts and you can’t help but feel proud to be apart of that history. My favourite place within the grounds is the lawn. You can truely sit down and reflect within the beauty and history of the home of Scouting. On another note, I have yet gone to Brownsea Island where the first scout camp that was organised by Lord Baden Powell was. I would imagine that it would perhaps give the same feeling and pride that is felt in Gilwell Park.